The majority of us are ordinary citizens. Ordinary in the sense that we go about our own lives without much influence on the system that surrounds us. However, with every turn, our lives are affected by the system we live in. Let me make myself clear by giving an example. It can be a very simple thing, for example: You want to start a small business because you want to support your family and earn an income. Having registered your business, you now may want to apply for the relevant permits or licences. This application process should be a simple and routine process. The relevant authorising officer should simply ascertain whether your application complies with the law. If all requirements under the law are complied, then, the application should be expeditiously approved. If there are any shortcomings, he should advise you to rectify the same. After all, civil servants are supposed to be civil and “servants” of the Rakyat. However, do things always go according to what I have described above? You may meet an officer who wants to be taken “care of” before he can “speed up” or even approve your application. You are in a dilemma.You are starting a business because you need income to live but you have to pay “toll” first. You also know that the request is immoral and illegal because it is corruption. You get frustrated, maybe angry but you realise you need the licence. You have bills to pay. You have a family to support. You have to find money to live because God has given you a life. So, you need the licence or permit. All you want is to do a business and earn honestly. But the system seems to oppress you and prevent you from doing so. So, you weigh your options. You can report the officer to his superiors – but will the superior protect his officer and put you into trouble instead? Your mind worries. All you want is just the licence or permit. Maybe you should report the officer to the MACC, you wonder. But all you want is just the licence, your mind insists. Further, you are concerned about “how to prove.” It is just your word. You are also concerned that your application for the licence may be further jeopardised. In this country, we still do not have an Act to protect whistle blowers adequately. You may also consider the last option of doing your business without the licence – illegally and running the risk of “greasing” enforcement officers instead. Or finally, you may decide to forget about the licence application and tell your family that they just have to starve. (3) Your application is “considered” and rejected though you comply with all the requirements of the law. You go back home and tell your kids that papa cannot afford to support them since the government does not give him the licence to start a business. They and your relatives begin to hate the government whom you now see as wanting your family to suffer. Your kids ask what wrong have they done. You have no answer. It is the system that YOU have allowed to evolve. I am not exaggerating here. Over the years, I have heard these complaints so many times from low and lower middle income people who want to start a small business honestly. I have offered to pursue the matter but most of them are afraid. It also does not help that some of the complainants are Malays because the oppressive officer is also a Malay. It is such stories that have convinced me that corrupt and evil people come in all skin colors and labels. They eat the flesh of the weaker ones from any tribe including their own to satisfy their evil and selfish desires. This is why I have always maintained that tribalistic mentality is not good for the majority weaker ones in the tribe. Racism is a cover to exploit one’s own race and spread hatred. You can apply the above story to every aspect of your life – every single government department, agency, the so called Courts of justice, etc. There are rotten people everywhere. However, not all become unjust due to money. There are other motivations or reasons – friendships, pure laziness, indifference, arrogance, etc. The effect is: You are inflicted with injustice and you feel powerless to do anything about it. You feel alone in the fight. The system should work. It should work for the People. We have to study the system and rectify its weakness so that ordinary people are not being pushed around, bullied and oppressed. People must insist that they too have a dignity that must be respected and recognised. If you have a high sense of dignity and refuse to be cowed by people in seeming power lording over you unjustly, what do you do? You know there will be risks in opposing these people because even other citizens may not support you. Citizens tend to be selfish. “Not my problem.” may be their mindset. I am sure many times, you may have wanted to take the law into your own hands and “get justice.” Inflict a pain on the oppressors. Make them suffer as they make you and your family suffer. However, such an approach will not solve the problem in the long run. It may also get you into problems with the law. So, if you are a Rapera, what would you do? What would you do? What I know is that a single voice is never loud enough to be heard. LB: This post originally appears in the writer’s blog, Rapera. Posted on 29 May 2010. You can follow any responses to this entry through the RSS 2.0. Times like these I wish I was a kampung girl working in KL with a social activist slant. That way I could bring the truth back to my village and start a movement there to ensure that they and the surrounding villages vote based on the truth they now know. I am glad many people are aware of what's really going on but I'm just not sure the rural folk feel the same way. And it's not their fault if they are only getting one side of the news. If I ever come across that situation, I'll reach for the sharpest object on the desk (like a letter opener) and stab the corrupt official in the eye. Yeah, I'll probably go to jail for that but I don't mind sacrificing myself for the greater good. – Ta'akan lah ta'de apa apa. Ironic as it seems, one would be a fool to go by the "law" in Malaysia. "Illegality" seems the way to go. It is a lawless country, this Malaysia! What Jahaberdeen wrote is common knowledge and I have experienced this myself and so too are my friends and contacts. As far as Chinese businessman are concerned, they consider these extras cost as part of business startup cost. Of course, the consumer will pay for it through higher prices charged by the business owner. Having setup a trading company in Singapore and finding how simple and straight forward the process is I have decided never to setup any business in Malaysia except to do "illegal" business. It is far easier to do anything that's "illegal" and profitable too. After all if one is caught, there is an easy way to get off the hook (you know what I mean). I have no confidence in the present govt and I dont think there will be changes in my life time. Therefore, I have my family emigrated. My children have taken up citizenship of the host country but I remain Malaysian for a simple reason that I still have family ties in Malaysia. As far as I am concerned, I have adapted to "play" the system in Malaysia and so are others. After all, see how elites in the govt, especially UMNO are enriching themselves in the name of religion, race and country. I have only one conclusion – Malaysia is "kaput"
How to save 1Malaysia when it does not even exist in the first place? 1Malaysia can only happen when the racist BN is sent packing lock, stock and barrel. If the "morals of the country" stinks, then it is because the morals of Umno politicians stinks. To the vernacular schools it gives a pittance for support, and to malay language schools, there is no need to be diplomatic and call them "national language" schools, it gives 100% support. Farish Noor once said "Umno ternak melayu untuk disembelih". Corruption in high places is so institutionalised that it has become a virtue. If you can get away with murdering, it means you have the power and connection; if you can get away with cheating, it means you are smart; if you can get away with bullying, it means you are more equal than me; if you can get away for hijacking the established businesses of others, it is called the NEP. Kill the cancerous disease and the patient will survive, likewise get rid of the root cause and the Nation will survive and thrive. It does not matter what they do because whatever they do will be to no avail. Like RPK said in London, it is no good attempting to treat the symptoms because it just simply will not work. It is the cancerous disease that should be treated. So therefore as long as UMNO is in the driver seat then absolutely nothing could be done. Before anything else, UMNO will first have to line their pockets, then their families pockets, then their cronies pockets and then whatever morsels left to the selected segment of the rakyat. So how much is enough? It does not matter how much natural resources Malaysia possess for come one day these resources will eventually be exhausted. Then what? Be like Singapore one might suggest. But do our leaders have that mentality and maturity to do so? With the present government – not by an extra mile mate! So what can we the rakyat do? Well we can change all these just by a stroke of the pen. Quoting RPK, ‘We the rakyat is the boss’. 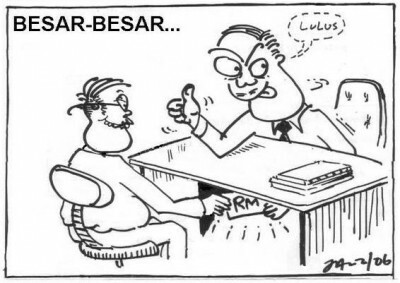 So come GE13 with the stroke of the pen, we could effectively change the government and consign UMNO/BN to the gutter. Well not totally to the gutter but enough to effect them to be the opposition as at the end of the day checks and balances are still needed irregardless of who is forming the government on that day. Vote the system out! Know who perpetuated the system for more than 50 years! Do not tolerate corruption and shout whenever public servants ask for bribes, no matter how high their positions may be. Be prepared to suffer in the short term. It is better to suffer for a while than to suffer for the rest of our lives!